Every now and again, an idea comes along that’s basically the same at the start as it is at the end. They’re not always the best ideas but they tend to be the ones you can explain in a sentence. “The boy who’s afraid of everything”, “Father Christmas is a secret agent” and so on. Then there are the ideas that start as one thing and grow, slowly, mould-like, into something else. Most of my ideas are like that – rather than the convenience of a lightning bolt of inspiration I begin with an impractically small seed of an idea and have to water it constantly (with coffee) for it to grow. 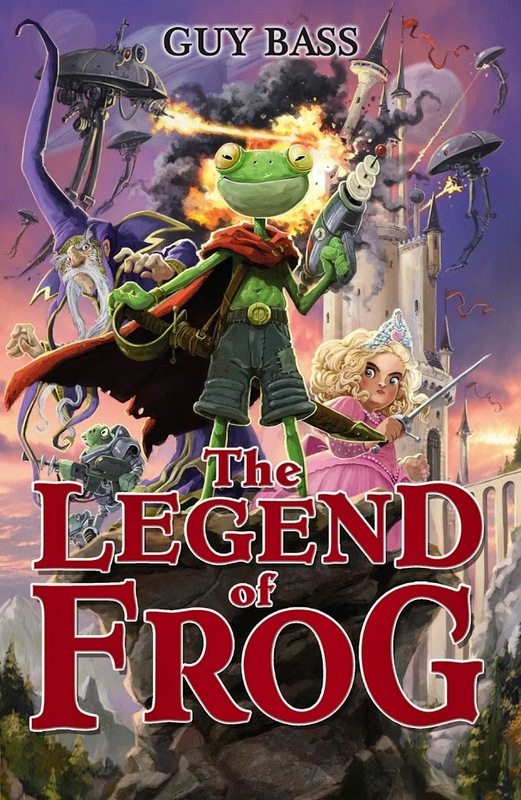 The Legend of Frog started life as bit of a science fiction story called Elbert at The End of the World, about the last living being on a post-apocalyptic planet. I thought it might be fun to write a book about the end of the world – and with only one character – while still trying and make it interesting and amusing. After getting stuck on who or what Elbert was, I started wondering about making him a mutated animal of some sort. A frog was one of the creatures on the list. I left the idea stewing and wrote a few books; by the time I came back I’d read and re-read a whole bunch of ye olde folkore and/or fairy tales, one of which was The Frog Prince. The Frog Prince is about a frog who basically pesters a princess until she kisses him – or angrily throws him against a wall, depending on which version you read. The best bit is where the princess makes the frog swim to the bottom of a pond to retrieve a golden ball. One of the few references to the Frog Prince in my book (other than there being a princess!) is a long swim to the bottom of a lake. As I read the Frog Prince a few thoughts occurred to me about my end of the world story. What if the world hadn’t ended but our hero had been told it had? And what if that meant he accidentally brought about the very apocalypse he’d been told had already happened? What if, when the frog swam to the bottom of the lake to get the princess’s golden ball, he accidentally woke a sleeping army from outer space, which proceeded to destroy the world? What if aliens invaded a fairy tale? I’d had a lot of coffee. Suddenly my mess of a story was exciting again. It quickly became an even messier mash-up of fairy tale, fantasy and science fiction. Taking elements from Flash Gordon, Star Wars, The Princess Bride, Masters of the Universe, The Lord of the Rings, alien invasion B-Movies – and of course The Frog Prince – I made an omelette of all the stuff I loved from books, comics, TV and film and bunged it into one story. Now I’m off to make more coffee.